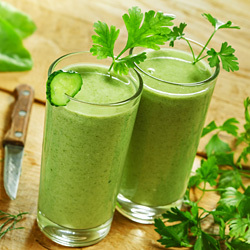 Green Tea Smoothie, a smoothie made with green tea and fresh fruits, is a novel way of drinking green tea. Regular green tea intake increases the metabolism and helps in increasing weight loss. There are two different ways of making this healthy drink. Following easy recipe uses green tea bags and fruits. Heat 1/2 cup water and brew green tea by dipping tea bag in it. Cool it by adding 3 ice cubes. 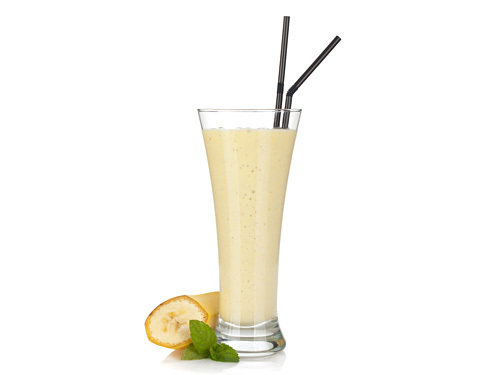 Combine sliced banana, honeydew melon chunks, honey, crushed ice and brewed tea (prepared in step 1) in a blender. Blend until smooth and frothy mixture. Check the consistency and add more ice cubes or water to make a diluted smoothie or add more fruits to thicken it. Refreshing green tea fruit smoothie is ready. Pour it in serving glasses and serve. The other way of making it is by using green tea powder instead of using tea bags. Taste: Mouth watering sweet and natural flavor of green tea with smoothness of honeydew melon and banana. Serving Ideas: Regular green tea drinkers have fewer chances of heart diseases and certain types of cancers. This smoothie is a perfect drink to start a day with loads of antioxidant benefits.